Tornado damage has been reported in Kearney, Nebraska. Early reports are (and I caution you all on this) the town has taken a direct hit. Wild weather this evening in Nebraska. There are multiple warnings out across a large area of the Northern Plains. Several good stormchasers are on location and are bringing live video from Severe Studios. 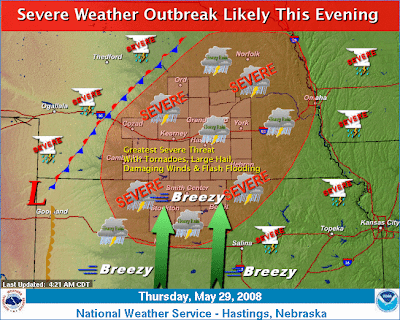 North Platte, Nebraska's NWS page is showing a good chance of severe weather. Also, checkout their severe wx page. I suspect we'll be hearing quite a bit of news from that area as time goes by this evening.